The cave is taking a considerable amount of time to get done. I say done and what I mean is to progress. It is hard to get it just looking right enough to be publishable. So I spend a lot of time trying to get various bits right. Now I also realize that as I complete sections of the cave they can be reused or reworked fairly easily in other sections of the cave scene. I also have to admit that there are a lot of pieces to the caverns within the whole cave scene. So many GameObjects. They take time to place and colorize correctly and so most of my last week was spent working on this. I must admit to quite liking what I have completed so far though. Even if I am only about 25% through it, gah! hahaha! Leilani has been very busy working on the main story arc and it is now about fully spec'd out and she is nearly ready to write it all out. I am very excited to have that done. It is late in the game development to really be getting it in, but we did not want to rush it... so instead we worked on all the other stuff to surround it. I believe the result will show we made a good choice. I have fixed up the Watergun mini-game and it now looks exactly like I wanted it to, phew. Done! 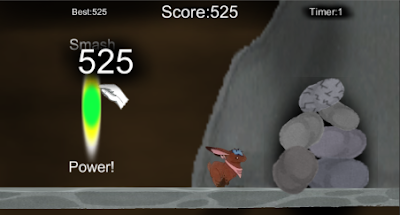 Rockfall has also has some tune ups by adding some animations it needed. Along with several bug fixes to mini-games now. It feels pretty amazing to say I now have 10 finished mini-games, the right number for this title. So onwards as we add in more graphics and complete more sections of the game. I am a bit late for writing this weeks wrap up, up. That is because I have been suffering a Migraine this weekend and it really knocks me about a lot. I hope to be fully functional by tomorrow. However me and Leilani did already have a fully productive week before the weekend migraine arrived. This last week we got through a number of things. As I am not working on a quest chain at the moment I got to work on something else and that is my Final minigame. OK, I say final as it is my 10th minigame. Though technically I call this one an Arcade Task, as it allows the player to fulfill an in game quest by completing the arcade minigame. This image above is the title page for the minigame. Not the most interesting ting I agree. The game is a simple timing game where you tap the screen at just the right time. Depending on how well you time your strike you will generate more power and smash the rocks faster. Faster of course equals more points! This is a unique style of game for VBHh and so fits in rather well. 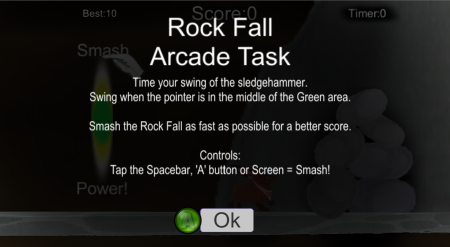 Now I have to hook it up to the Quest system and finish it off with a new animation of Jack swinging his Sledgehammer. I also really finished off that Bermuda Love Triangle quest line and so much more. Well on with the next week, where I shall be working on many a varied task. We have been working hard on several aspects of the game this last week. The image above is my first layout pass for the Cave system that I mentioned in my previous blog post. As you can see I have some detail already on the far left as that is the entrance. The rest is a major work in progress. 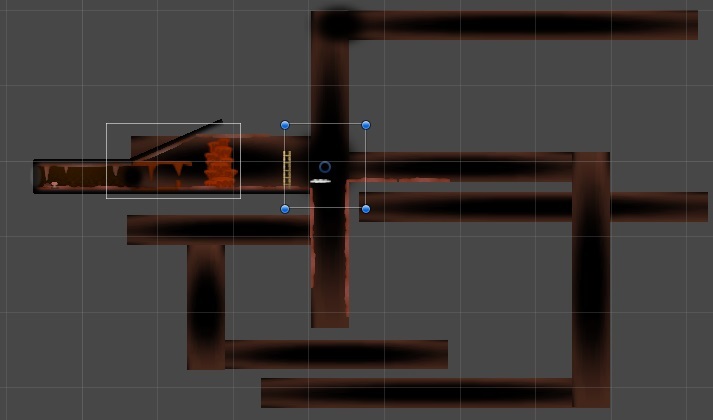 Just sorting out the collision areas is taking me some focus and time. Still it will be awesome when done. This is one of my side jobs as I move the rest of the game forwards. Another aspect of the game is the placement of the Quests.. or perhaps now I should call them narratives? While I have been inputting some of the quests I have run into several things that were needed to support them, such as more Items in the game, and even the Baker Trader needed to have her inventory refresh set up correctly. This was an interesting piece of code to write. We also in Fridays meeting got to discuss the Arcade Minigame Task we sort of had designed. It was not quite right. So Bam in only about 5 minutes we had all the extra bits sorted out and the design is done. Now the creation of that game is waiting on my todo list.